1. Best Brunch Spot: Royal Oak in Westheimer/Montrose area. “Though its not exactly LaStrada circa 1999 it is pretty close! Favorite Cocktail: Manny’s Mexican Martini at La Fisheria. is to die for! Not to mention, the ambiance is amazing! Gigi’s Asian Bistro & Dumpling Bar and more! Taps House Of Beers Washington Ave. 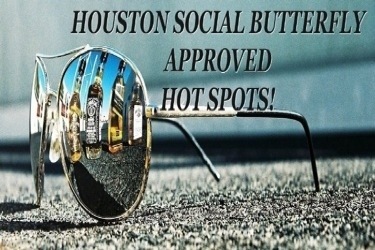 They definitely dont call you Houston Social Butterfly for nothing! You know where all the hot spots are and always got VIP wherever you go. You definitely make my life look so boring. I’ve read a ton of negative info on Drake & them being picky & racist at the door. I’ve also read it’s owned by the same guys that run Red Door. I used to frequent Red Door & never had a problem there. Although I can’t stand clubs that let riff raff in, I doubt I’ll waste any time or money there, much less get any of my friends to meet me there. Although most of my friends are also white, I do have friends of several other ethnic backgrounds that go out with us as well…and I do not have the temperament to deal with jerk door men/promoters that would treat my friends as second class citizens. I’d probably get mad, snap and get arrested for teaching the door man a lesson in humility. If you’ve been to The Drake lately you will notice there is a lot more ethnic diversity than ever before, so this negative info you’ve heard must be wrong(or quickly answered). Civil rights laws have virtually stripped private property owners of their…civil rights. The government removed private property owners from deciding who gets to patronize their place of business. The intention may be good, but in the grand scheme of things it has not improved race relations but instead made them worse in recent years. While it may not sound good to many on the surface, allowing a bar or club to cater only to blacks, whites, or whatever race would ultimately be a good thing, as our society would, without interference from the government, learn to get along with each other and reject those who choose to be bigoted. Kudos on Blue Label, Kobain, and 26Ten. I agree 100%. Can you tell me the best nights for these spots? WHere is there to go on a Friday night? Best nights for Blue Label are Fri and Sat..I hear thursdays are starting to hit too. know any good latin night kind of places for a Saturday night? the doormen at NOX are the biggest douches in the world. they make you wait in a line with no intention of ever letting you in. i can get into any club in midtown and the heights but apparently I’m not cool enough to get into this place. we’ll c how this place holds up in a few months when it’s not the new place to be. Well..I’ve been to Drake, but I don’t really like it. It feels like the riff-raff are starting to get in. Ei8ht is nice, but not all that. I went on opening night and again the following week, and there were alot of 50 year old guys inside, while the hot young guys were outside! There is an unrealistic line outside, and you’re lucky if you get in at all. Tip tip tip, is all I can say. However, I got a flyer to go to Cafe Europe on Sundays- for an outdoor patio event. We checked it out; and to my surprise, the place has changed! Best of all, the DJ was great! I am not into mainstream house music; I want to hear something NEW, upbeat and underground (Just got back from Amsterdam). My girlfriends and I had a great time, and the DJ was hot, too. We had fun and we didn’t have to wait in any lines or go too far from home. Just a thought. Your writing caught my eye. Thanks for sharing this information.